Over two years of wishing to make this Morocco itinerary come true and months of planning later, we made it to Morocco. I can’t even count how many times I heard friends talking about their trip to the country, and how many times W. and I had to postpone this trip for some reason. Well, now we’re back and have lots to tell! 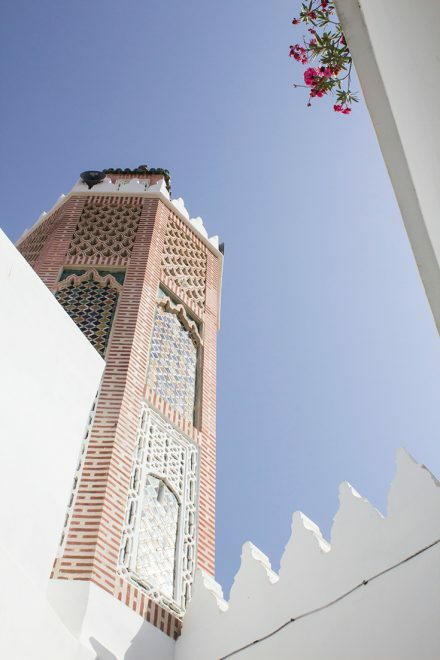 Morocco is a big and diverse country, with several attractive places spread in different parts and regions. From the start I knew that one week would never be enough to see half of what we wanted to and get the feeling of the local culture, so we decided that two weeks would be a good compromise. Deciding on the itinerary wasn’t easy, I changed it a few times and researched like crazy to make sure that everything was going to work out. How long to stay in each place? Is it worth visiting city X? Where to stay? How to get from A to B then to C? The only thing I was sure was that Marrakech would be our first and last stop. 3 days in Marrakech were enough to see everything I had in mind and even to take a day trip to the Atlas Mountains. Other day trips from the city are also possible, including Essaouira and Aït Ben Haddou. Marrakech is an easy city to get around on foot if you’re staying in the medina, which I highly recommend for a real Marrakech experience. There are almost never lines to visit the attractions and most of them are close to the other, which helps you save a lot of time. Where to stay: we stayed at the beautiful boutique Riad Dar Alif, located a few meters from the Palais Badi, from where you can go everywhere on foot and the owners will make sure you feel at home. Price range: 56-120 Euros per day (double room). Casablanca is the largest city and the main business center of Morocco, though, there aren’t many tourist attractions in town, which means normally one day is enough to visit the city. 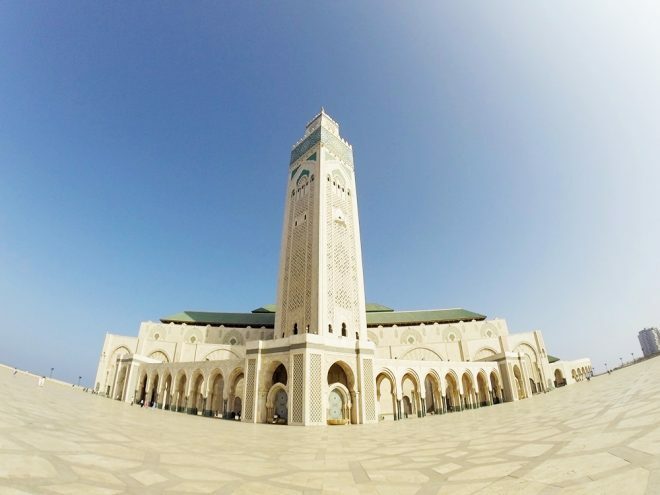 We had precisely 24 hours to see the main attractions, but if you don’t want any hurry, then 2 nights would be ideal (especially if you take into consideration that visiting the Hassan II Mosque, requires that you attend one of the offered tours, which aren’t many). Where to stay: we stayed at the amazing Four Seasons Casablanca, located at La Corniche, right in front of the beach. Probably the best hotel I’ve stayed so far. Price range: 250 – 2300 Euros per day (double room). Getting to Casablanca from Marrakech: the best way (on a budget) is by taking the train. It’s a 3-hour ride that costs about 135 Dhs per person in the first class. The trains work very well and most have air conditioning, but I highly advise you to buy first class. Another option is paying a taxi or renting a car, both will cost way more than the train. We had a complete day to visit Tangier, not only we managed to see all that we wanted, but also enjoyed the end of the day to visit the famous Cave of Hercules in the outskirts of the city. Tangier is becoming a very modern city, but the real city, or at least the one every traveler expects to see, is the medina. Where to stay: despite chaotic and loud, I highly recommend to stay in the medina, since it’s where you will see basically most of the attractions. Getting to Tangier from Casablanca: we took a train between the two cities, it was a long 5-hour journey, in which a first-class ticket costs around 195 Dhs per person. It is, of course, possible to fly, rent a car or pay a taxi to go from one city to the other. 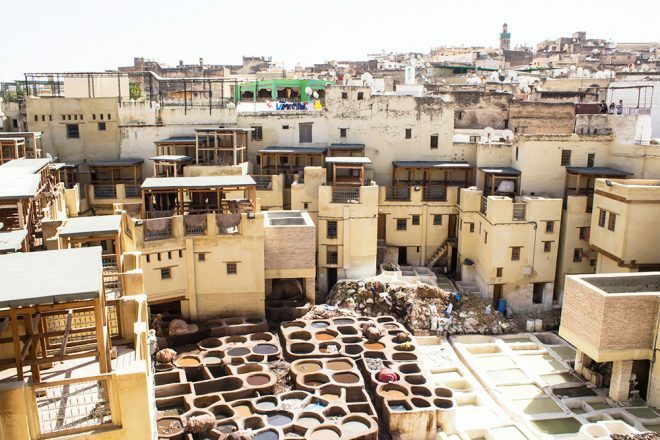 The famous ‘Blue City’ had to be on our Morocco itinerary. 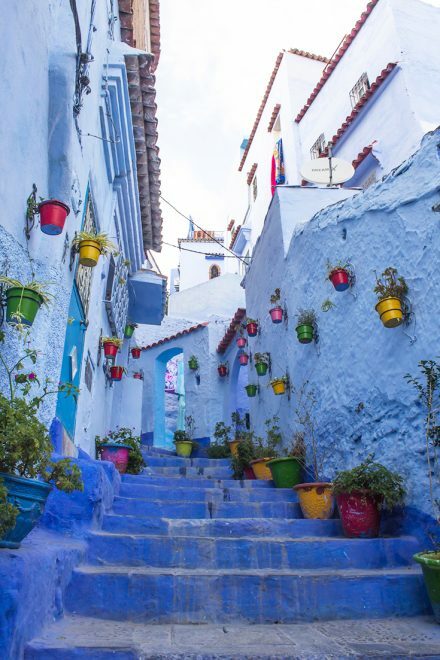 It’s a small town, tucked away among the Rif mountains, that became famous for it blue colored medina. You can easily visit the blue streets without any hurry in one day, but if you want to enjoy every corner and take your time, consider staying 2 nights. Where to stay: we stayed at the lovely Dar Zambra, right in the medina and with a great view over the city. Prince range: 45 – 75 Euros per day (double room). Getting to Chefchaouen from Tangier: you can either pay a taxi (it won’t be cheap) or take the bus with the company CTM, which is the best option. At the moment there are only 2 buses leaving from Tangier to Chefchaouen directly, early in the morning or in the afternoon. The 3-hour journey costs about 75 Dhs per person. Fez has always been high on my Morocco bucket list, in Brazil we had a very famous telenovela that was filmed in the city, and since then I always wanted to visit it. Fez has the largest medina in the world, with over 9,000 streets, yes it’s crazy. We had 2 complete days to enjoy the city, and we even had enough time to go to a Hammam and take a cooking class. Where to stay: we stayed at Riad Anata, a beautiful place with a great location in the medina, and with delicious food. It was also where we had our cooking class, with their talented chef Samira. Price range: 105 – 135 Euros per day (double room). Getting to Fez from Chefchaouen: the only options are paying a taxi or again, taking the bus (considering you don’t have a private car). It’s a long journey of approximately 5 hours, but costs around 75 Dhs per person. 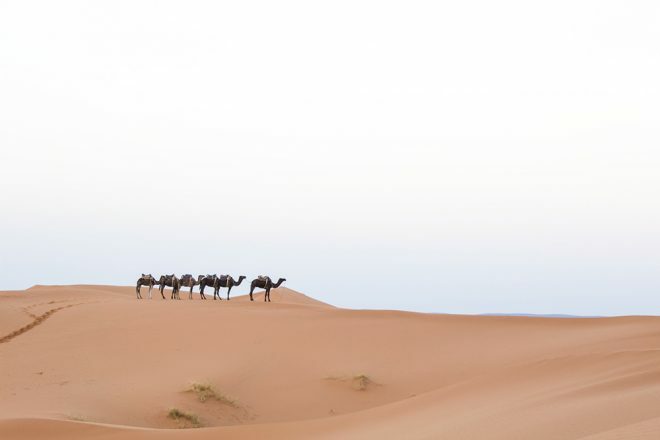 There are two options to visit the Sahara Desert in Morocco, one is via Merzouga, the other is via Zagora, more to the south. 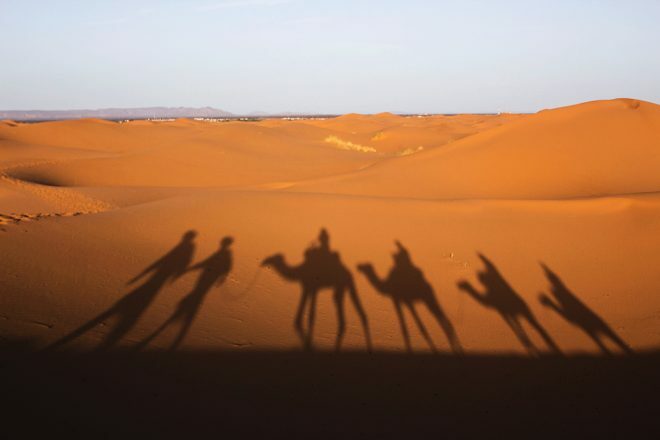 We finished our trip returning from Fez to Marrakech via the Merzouga Sahara Desert. We had 3 complete days and 2 nights to accomplish the journey with a private driver. We passed through different places and amazing landscape, saw monkeys in the wild, admired incredible views from canyons, slept in a tent in the desert, visited the filming location of the movie Gladiator and the TV series Game of Thrones, and much more. It is an experience that I highly recommend to anyone! Suggested company: we chose Mouhou Tours and were very happy with their services and friendly driver! 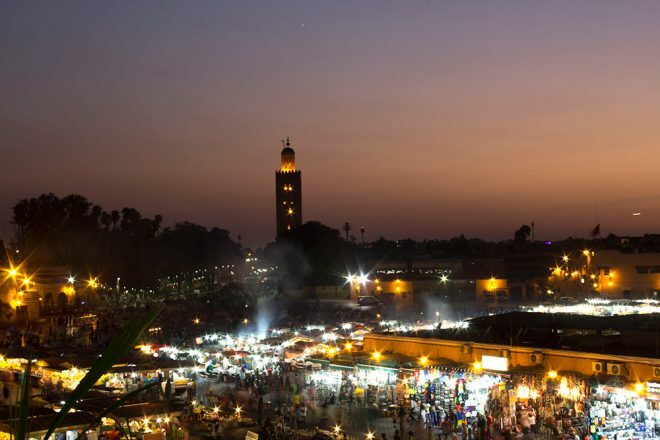 One of the best decision of our itinerary was saving our last night for Marrakech, it was like returning home, after all, it was our favorite place of them all. It was also good to enjoy a last day to pack, think of all that happened on the trip and relax a bit before returning home. We loved the Riad Dar Alif so much, that we stayed there once again. Would we change anything in the itinerary? Honestly, no, the time for each place was enough, the transportation methods that we chose were ideal for us, and the order in which we visited each place was perfect. Whenever we return, we will make sure to visit Essaouira and the Sahara Desert in the south. 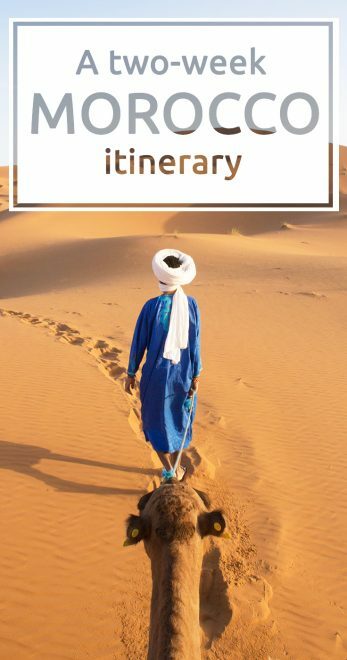 Looks like all your planning really paid off Allane as this itinerary looks so comprehensive and as if you’ve covered most of the Morocco Highlights! I’d have loved to have visited Chefchaouen when we went to Marrakech but it was just too far considering we were only a long wknd! Next time you go I really recommend Chefchaouen, is really pretty!! I hope I can post useful things for your trip!! I can’t wait to know what you will think of Morocco! We went to Merzouga and stayed with Mouhou Tours, they organize everything for you!